What are the criticisms against Psalm 83 being the next end times war? We asked this question on our television show Christ in Prophecy of Bill Salus, author and radio host of Prophecy Depot, who believes the next war prophesied in end time Bible prophecy is going to be the war described in Psalm 83. Nathan Jones: Bill, in looking at 2 Chronicles 20, skeptics will say that battle was fulfilled during King Jehoshaphat's time when he destroyed Moab and Edom. Is that the truth? Was that battle fulfilled prophetically in a long past time period? You're saying no, but they point to this passage and say there could be some parallels. 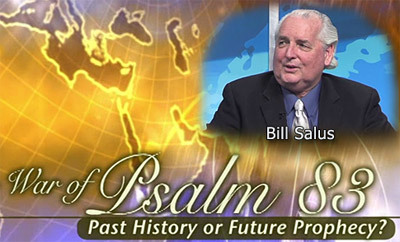 Bill Salus: That is one of the arguments used against Psalm 83 being a modern day war. If I remember, you had a blogger ask this same question back in 2009, Nathan, you probably recall. I wrote an article in response titled, "Has Psalm 83 Found Final Fulfillment?" It then actually became an appendix in my newest book. One of your bloggers had voiced the concern that this war might have been historically fulfilled. When you study 2 Chronicles 20, you realize that in the Hebrew Masoretic texts, in the Latin Vulgate, in the Greek Septuagint, and the new modern English translations, that there were really only three or four populations at best that would have fit into that prophecy. It could have been a partial fulfillment, but a final fulfillment would require all ten populations of Psalm 83 to be involved. Really, who was involved for the most part in 2 Chronicles 20? It was Jordan and part of Syria. There's no Saudi Arabia, no Lebanon, no Egypt, no Gaza, no ancient Philistia listed there. So, 2 Chronicles 20 could not have been the final fulfillment of Psalm 83. Dr. Reagan: I think you are right on target with that ascertainment. I don't see how anyone could possibly argue that 2 Chronicles 20 was a fulfillment of Psalm 83. It covers mainly two population groups that are in Jordan today, but certainly not all the groups surrounding Israel. Dr. Reagan: Bill, another critical response to your thesis is that Psalm 83 was fulfilled in the Israeli wars of 1967 and 1948. Or, even 1967 and 1973. Psalm 83 then would be a series of different wars, but modern day wars that have already occurred. What about that criticism? Bill Salus: I address that criticism of course in my book as well. Let's take 1967. I think we can eliminate that war really quite quickly, much like we eliminated 2 Chronicles 20 as a historic fulfillment. In 1967, there were three of the ten populations found in Psalm 83 involved. In 1967 the nations attacking Israel were primarily Egypt, Jordan and Syria. Not all ten, like there was no Lebanese involvement. First of all, these past modern day wars with Israel were indeed partial fulfillments. They express the attitude of Psalm 83, in that these surrounding nations want to destroy Israel. But, I believe Psalm 83 is a prophecy in process, and these are partial fulfillments. Now, in 1948, we had Lebanon, Syria, Iraq, Jordan and Egypt attempting to destroy the new state of Israel. Those were the main belligerents, but they also had foreign assistance coming from Pakistan, the Sudan and Yemen. These supporting nations are not listed in Psalm 83. You can't put a square peg into a round hole, because to do so you are throwing in other populations into the Psalm 83 prophecy. One of the main reasons I believe Psalm 83 has not found fulfillment yet is that we are told in Psalm 83:9-11 when Asaph petitions the Lord to deal with the confederacy that is going to come against them in the historical precedent of the Midianites and the Canaanites, then he draws our attention back to Judges 4-8. At that time in chapters 6-8, Gideon had to go against the Midianites who had oppressed the Israelites for seven years. Judges tells us that Gideon went and with just 300 men killed 120,000 Midianites. Oreb and Zeeb, the princes, were killed by Gideon's men. Zebah and Zalmunna were killed by Gideon himself. The Midianites ceased to ever oppress Israel again. The same story comes up in verse 10 and 11 in Judges, where it's talking about the Canaanites. In Judges 4 and 5, Deborah was the prophetess and Barak was the general of the Israeli defense forces of those times. They defeated the Canaanites who oppressed them for 20 years. After that, you'll never find another story of the Canaanites like the Midianites oppressing the Israelites again. I think that is a sound argument why this prophecy has not found fulfillment yet, because these other Arabs still stand to confederate and oppress Israel. I think Asaph is saying, "Stop them so they can never oppress us again." Nathan Jones: What about Ezekiel 38 & 39 being a fulfillment of Psalm 83? That war is a future war pretty clearly, but some argue that when it talks about the other nations that go along with Gog, then how is Psalm 83's nations not part of Ezekiel 38 & 39, also called the War of Gog & Magog. Bill Salus: There are different populations participating in each war, different motives, and different destructions. Just in summary, none of the countries that Ezekiel 38 & 39 share common borders with Israel are mentioned in Ezekiel's list. Ezekiel talks of Russia being probably involved, and certainly Iran, Turkey and Libya. Nathan Jones: You call Ezekiel 38 & 39's nations the "outer ring" of invading nations coming against Israel? Bill Salus: Yes, they are the outer ring of countries. They do not share common borders with Israel, while all of Psalm 83 does. They are coming against a different Israel than we experience today. They are coming against an Israel dwelling securely, and it's very prosperous because Ezekiel reveals that Russia is coming after Israel's great bounty to plunder. If you think about it, imagine today Russia putting a coalition together, and it's an imminent event like some people teach. I personally don't think the War of Gog & Magog is imminent. I think Psalm 83 precedes it. But, it would be like America going and enlisting Canada and Mexico to come against the little state of New Jersey. It just seems so overwhelming, right? Why would Russia need all these big friends to come against a little Israel? I don't think it will be a little Israel anymore by the War of Gog & Magog. I think it's the Israel that has won a war and has defeated their Arab enemies. They feel free to tear down their protective walls, bars and gates. They can stretch out their elbows and annex some lands, hence the subtitle of my book, "How Israel Becomes the Next Mideast Superpower." I believe the Israel that Russia comes after in the War of Gog & Magog is a much different Israel than we have today. It is much more wealthy and much more secure. A greater, safer Israel is one freed from Arab torment and terror. That's when Russia puts together its predominantly Muslim coalition of Iranians and Turks and asks them, "Are you going to allow Israel to do that? To win that war to annex territory?" And we know Israel annexes territory, for they did it in 1967 after they won the Six Day War. We know King David did it 3,000 years ago. Joshua did it 3,300 years ago. I suspect with all the prophecies found in the Bible that Israel after defeating their bordering neighbors is going to grab some of their territory. Obadiah suggests they are going to grab up southern Lebanon. Jeremiah 49 suggests they are going to grab parts of Jordan. Isaiah 19 suggests that five cities will speak the language of Canaan, which is Hebrew, in Egypt. So, we have I think an Israel that's going to expand. I don't think they are going to get all of the land that they were promised in Genesis 15:18 from the river of Egypt to the River of Nile, but they'll have control over their neighbors. Dr. Reagan: Israel will not get all the land God promised them until the Millennium. Bill Salus: Right, not until Christ comes. But, I do believe they are going to expand incrementally a little bit, and especially after Psalm 83. Dr. Reagan: Another criticism some say against Psalm 83 being a contemporary end time war is that Psalm 83 must then be part of the Armageddon campaign at the end of the Tribulation. What about that? Bill Salus: Yes, that is one of the final arguments I hear. I think that one is probably one of the easier ones to dispel, too. If someone understands the Tribulation, then they know that the seven year period is often divided up into two halves based on verses in Revelation 11, Revelation 12, Daniel 7, and Daniel 12. They talk about the first 3 1/2 years and a second 3 1/2 years. The first 3 1/2 years are characterized by an Israel that is dwelling in a sense of false security. The confirmation of a false covenant has been made by the Antichrist in Daniel 9:26-27. Israel then feels as if they are dwelling securely, although it is a false sense of security. But, they're not fighting off the Arabs for a change. They're not engaged in a massive Arab-Israeli war. They are actually feeling like they are at a point of peace. As a matter of fact, Israel becomes so complacent that the Israeli Defense Forces I believe can't even stop the Antichrist from going in at the middle of the Tribulation and abominating the Temple. So, that's the first half. Now, the second half of the Tribulation even Jesus warns in Matthew 24:15-19 that when you see the abomination that causes desolation which characterizes at midpoint of the Tribulation, He tells the Jewish people to flee immediately. That's flee immediately, not fight immediately. Flee immediately because there is a genocidal attempt that's coming upon them, even worse than any of the others before. We are told in Zechariah 13:8 that two-thirds of the Jewish people will be cut off in from the land. They will not be fighting in my estimation, they will be fleeing. Therefore, Psalm 83 cannot be part of the Armageddon campaign. It will probably precede Ezekiel 38 & 39 and even be a Pre-Trib event. Psalm 83 will probably happen in our time, and that's what I'm watching for it really quite closely. Remember that Psalm 83 couldn't have happened between 70 AD and 1948 AD because the specific mandate is for those bordering nations to want to destroy the nation of Israel and that the name of Israel can be remembered no more. There was no nation of Israel in those years. We've already put forward that Psalm 83 couldn't have happened in the Old Testament. It couldn't have happened in the Diaspora. But, it can happen now since 1948. And, it won't happen in the Tribulation. Dr. Reagan: You feel very strongly that Psalm 83 is likely to be waged before Gog & Magog? Bill Salus: I do, because Israel does not dwell securely right now. That is a prerequisite from Ezekiel 38:13. Dr. Reagan: Joel Rosenberg feels otherwise. Have you ever discussed this with him? Bill Salus: I've not had the opportunity to discuss it with Joel. And, Joel's not the only one that feels that way. There are other Bible prophecy teachers who believe that Ezekiel 38 is probably a more imminent event. Dr. Reagan: I don't see how they can say that though when you consider the fact that Ezekiel says Israel will be living in peace. There's just no way that Israel is living in peace right now. Bill Salus: These other eschatologists sort of redefine what I think the Hebrew word yashab betach means. Dr. Reagan: They must redefine what peace means as well. Bill Salus: I think a lot of them. I'm not going to speak for Joel, but a lot of them believe that it is a sense of security that Israel would develop because they have comfort in their own Israeli Defense Forces and their ability to defend themselves. But, I just don't buy it. I don't buy it. a.) How can it be proven that Psalm 83 is prophetic? I replied with chapter and verse proving that Asaph was a "chozeh" and therefore Pslam 83 was, if nothing else, a prophetic song sung by Asaph before David and/or Solomon. b.) Are their any mirror prophecies in the Bible. Yes again. Ezekiel 28:24-26 and Isaiah 11:11-16.
Who can argue with what God has said? I don't disagree that Psalm 83 is prophecy. It sounds like it to me. I just don't agree with Salus' interpreation of it. I don't see a superpower United States of Israel dominating the entire world. Instead I see Pslam 83 happening near on in concert with Gog/Magog whereby Israel is saved by God and they turn back to Him (though not to Jesus) and hence the peace treaty for the world would want peace, for a time of peace would mean STOPPING Israel from BECOMING a superpower. With no war then Israel would have no reason to go on an imperialistic conquest and would be contained. Things will settle into place (no Russia, no arab threat as they are defeated). Israel would spend 3.5 years focusing on building the temple and getting re-acquainted with God. The antichrist can solidify his position and empire during the time period, too. The all hell will break loose with the abomination of desolation of we all know the rest. Am I right? Maybe. Maybe not. He that rejecteth Me and receiveth not My words, hath one that judgeth him: the word that I have spoken, the same shall judge him in the last day. Thanks Bill for this lucid interpretation of Scripture. Glory to God! I have always thought that the last war will be after the 10000 years of Jesus rule.. The Devil will be released and come against Jesus and the Israels, and then they will be completely destroyed. (all people that didn't repent. "...because of the scripture Jesus says they being jewish nation do not believe when He comes in His name but will believe when he comes in his own name and I assume that is the antichrist." You're referring to Jesus spoken prophecy per John 5:43 (NKJV). Read the entire chapter for the full context and also chapter six to see what happened next. "I have come in My Father’s name, and you do not receive Me; if another comes in his own name, him you will receive." And Jesus was indeed referring to some Jews receiving a false messiah. Do you know that in the eschatology of the Orthodox Jews they are expecting two last days messiah's? Yes, they are expecting a mortal man whom they refer to as messiah Ben Joseph first, and after he dies in the Ezekiel 38/39 battle they are expecting a second mortal man known as messiah ben David to appear. Neither of these expected messiahs do they believe will be anything more than a mortal man. It is the second of these that will be the one we refer to as the Antichrist, the Beast of Revelation 13. What does Jesus also say to the Jews in Matthew 24:16 regarding the man-made image of the false messiah? You should seek out the sound teaching of Bible prophecy from those you know here on the Lamb & Lion website, and relegate the teaching of those whom you do not know in its proper place. The Two Witness and the 144,000 Jewish male evangelists go about their ministries during the first half of the 70th Week. Obviously, this period of 3.5 years is post-Harpazo but pre-Abomination of Desolation at the middle of the 70th Week. This is the point during the 70th Week, between the blowing of the 6th and 7th trumpets, when the Two Witness are killed by the false messiah and after 3 and one-half days in a street of Jerusalem, they will receive from God the same nĕshamah chay (breath of life) that was given to Adam in Genesis 2:7 and they are harpazoed straight into heaven in front of the eyes of all. In that same hour an earthquake will level 1/10th of Jerusalem killing 7,000 people, but the remainder of Jerusalem will give glory to the God of heaven. Read and study the Bible and its last days prophecy diligently, be a Berean! Berean's were Jews who lived in the city of Berea in Greece and who Paul wrote about in Acts 17. Unlike the Thessalonian Jews the Jews of Berea eagerly accepted the Gospel of Jesus Christ that Paul and Silas brought to them, and wanted to hear all they could about Christ. They would fervently study the Scriptures of what we call the Old Testament, the original Jewish Bible. In those Scriptures they found the promise of the Messiah and recognized Him as jesus Christ. So, that's what it means to be a Berean, to eagerly search Scripture for God's Truth. The trite "agree to disagree" applies.